RESIDENTS living near Casement Park have rejected the GAA’s latest plans for the West Belfast venue. The GAA unveiled their plans for a 34,500 capacity stadium this week, incorporating 8,500 terracing. The height and capacity of the new stadium has been reduced from the previous plans which were quashed by a High Court judge in December 2014. While many residents living in the vicinity of the ground welcomed that decision, the GAA was left reeling. Since May Ireland’s largest sporting organisation has begun a consultation with the wider West Belfast community ahead of a new planning application, which is to be lodged with Belfast City Council by December. However, this afternoon the Mooreland and Owenvarragh Residents’ Association (MORA) rejected the latest plans, specifically mentioning the scale of the project, safety and concerts at the venue. 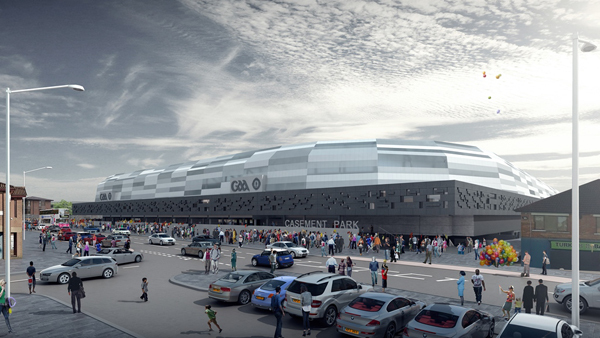 “While the GAA has made a number of changes to the Casement Park design, new elements have been added that raise more questions than there are answers at this time,” a spokesperson told the Andersonstown News. The spokesperson said the proposals made by the GAA to mitigate traffic impacts around major sporting events “lack detail”. “While the proposals aspire to change the travel culture of GAA fans in Ulster, by reducing reliance on private motor vehicles, we have not yet seen hard empirical evidence that the GAA’s aspiration is achievable. The spokesperson added: “While the revised proposals are not acceptable in their current form, MORA will nonetheless continue to engage in the consultation process. We have attended the events that the GAA have organised in the Andersonstown area and will make a more detailed submission to the GAA within the consultation deadline of 5 December 2016. “Ultimately, however, we believe that the GAA should acknowledge the very constrained nature of the Casement Park site and propose a redevelopment that is in keeping with its surroundings, i.e. a county ground for Antrim with an appropriate and safe capacity.